Ballari, Jun 9, 2016: Surfacing several days after resigning and remaining incommunicado, a senior woman police official who was reportedly at loggerheads with the labour minister today said she would not go back on her decision. 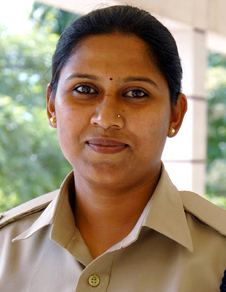 Deputy Superintendent of Police (DySP), Kudligi Sub-Division in Ballari district, Anupama Shenoy had tendered her resignation on June 4 and since then her whereabouts were not known. A special team was formed to track down Shenoy, whose alleged posts on Facebook levelling accusations against Labour Minister P T Parameshwar Naik, also the district in-charge, had created a flutter. She was reportedly upset that the minister was interfering in her work. Speaking to reporters on reaching Kudligi, Shenoy today said, "I stand by my decision to resign." Asked about her Facebook posts, she said "I don’t know about Facebook; someone might be doing it in my name, it might have been hacked also." Naik had said he has nothing to do with the officer’s resignation and he also expressed doubts about the veracity of the Facebook account and its user. Following protests by a group of people against her for taking three persons into preventive detention, Shenoy left the office on June 4 after handing over her resignation letter to subordinate officers, instructing them to hand it over to the Superintendent of Police. Officials said Shenoy was acting on a complaint by Dalit activists against the extension of a liquor shop that was blocking the way to Ambedkar Bhavan nearby. On the directions from the government, Ballari SP had yesterday deputed an officer to go to her hometown Udupi to contact Shenoy and her family. "We have come to know that she has come to Kudligi. We will see what she will do; we don’t have any information on whether she will come and meet us or not. We will send our staff and try to find out about it," Ballari SP R Chetan told reporters. "We had messaged her and tried to contact her but contact was not possible. If she comes we will talk to her," he said. Meanwhile, Shenoy refused to meet Kudligi in-charge DySP R S Patil who went to her official quarters in Kudligi today. In January, Shenoy was transferred allegedly at the behest of Naik for putting his call on hold, with the incident triggering a storm. A video footage purpotedly showing Naik making a boastful claim about shunting out Shenoy had also gone viral later. Chief Minister Siddaramaiah has said the government would not take any hasty decision and would want her to continue in the force, but also pointed out that she was bound by rules. When the Self respect is hurt we take the very rough decision without caring about anything . Police are not the puppets of politicians.